It’s that time of year when my backpack starts to get real heavy. Not from school books but from squash and pumpkins! Nothing says fall more than seeds roasting in the oven. Roast a squash, and you will have the base for a variety of meals, from squash soup to ravioli.Today’s recipe takes a classic grilled cheese and ups the ante by adding in garlic roasted squash. It’s a perfect dish for leftover squash, or try it with pumpkin too. Use any squash you prefer. I had butternut squash on hand. It’s low in fat, filled with fiber and significant amounts of potassium (important for bone health) and vitamin B6 (essential for the proper functioning of both the nervous and immune systems). Add a squash to your shopping bag and lift from your legs (not your back) for this gooey, delectable Fat and Happy sandwich. Let’s not over-complicate this: Smash some roasted squash (recipe below) onto a piece of bread and top with some cheese. 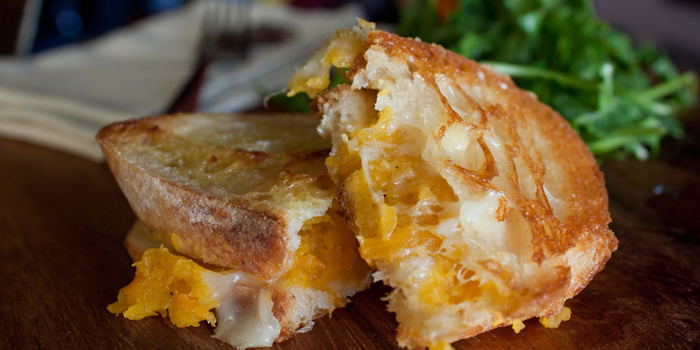 Spread coconut oil on each side of the sandwich, toss into a pan over medium heat until golden brown. Flip and brown on the second side. 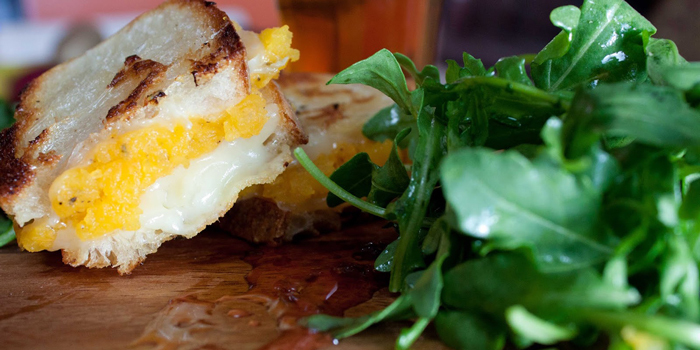 While the squash grilled cheese is doing its thing, toss the arugula with a little drizzle of olive oil and a squeeze of fresh lemon. Top with good coarse salt. I used a black lava salt. Rub the inside of the squash with olive oil, and add a touch of minced garlic with some salt and black pepper. Place cut-side down onto a parchment paper-lined cookie sheet. Fat and Happy Food Blog Tips and Techniques: Cutting the squash in half will be the hardest part of the whole process. Besides a sharp knife, try using a dead blow hammer. I’ve designated an old chef’s knife for this rather than use my good ones.